Investigators say that emergency exits were blocked and a security guard turned off the public announcement system when he received a call about the blaze, though it isn't known why. An entire class of schoolchildren apparently died in Sunday’s fire, some having had the chance to make desperate, futile phone calls to parents or relatives before succumbing to the smoke and flames. Russian social networks were flooded with grief, and a measure of anger over the response. Officials said fire exits were blocked and an alarm had been turned off. The disastrous blaze joins a long list of accidents, fires and sinkings in Russia marked by apparent negligence beforehand and inept or insufficient response by emergency services. Russian prosecutors can be quick to assign criminal blame in such cases – and rapidly went to work in Kemerovo – but subsequent promises to step up safety measures often prove to be halfhearted. “We are burning, perhaps this is goodbye,” a 13-year-old named Maria posted on her social media account, according to the Rossiya-24 television channel. Hers was one of about 30 goodbyes posted by children who would not log into their accounts again. The fire broke out Sunday afternoon, the first day of a weeklong school break. A class from a school in the small town of Treshchevsky had come to Kemerovo to see a movie at the Winter Cherry mall, eat ice cream and jump on a trampoline. On Monday, parents of the students visited hospitals hoping to find their children. The director of the school, Pavel Orynsky, broke down while describing the students on camera. 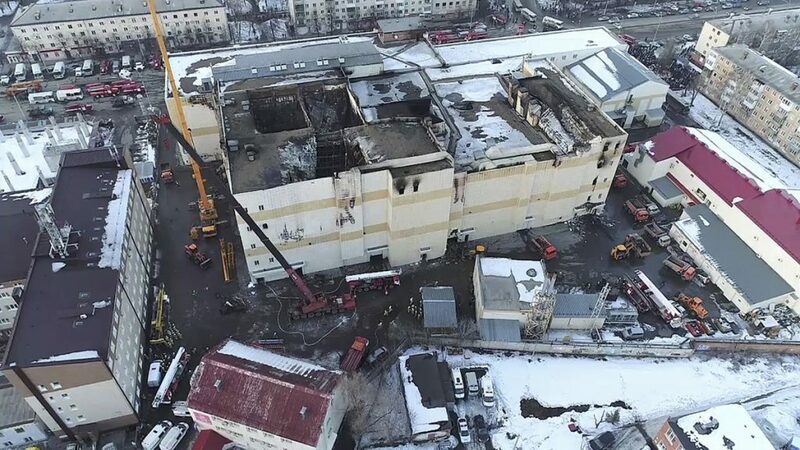 This aerial view shows emergency services cleaning up the wreckage at the scene of the multi-story shopping center after Sunday’s fire in the Siberian city of Kemerovo, about 1,900 miles east of Moscow, Russia. “She told me that everything was on fire, that all the doors were blocked,” Yevgenia said, struggling to overcome her tears. 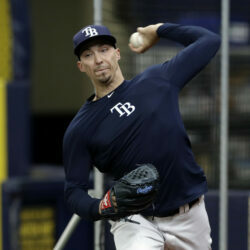 “They took three minutes – three (expletive) minutes! – to put on their masks,” Lillevyali said, with tears in his eyes. “He lost his parents and a younger sister in this tragedy,” Skvortsova said. Videos posted on social media showed others jumping from fourth-floor windows. One showed men attempting to break out of a locked stairwell as flames encroached. Another video, apparently taken from a security camera, showed that mall patrons on the fourth floor had little time to react. The inferno erupted and spread through the children’s play area in a matter of seconds. Russia’s Investigative Committee opened a criminal investigation on Monday and detained several people involved in the mall’s operation for questioning. Committee spokeswoman Svetlana Petrenko said authorities were looking into several “serious violations” of fire safety codes. The cause of the fire has not been determined, but the Kemerovo region’s vice governor, Vladimir Chernov, said the working theory is that a child may have used a cigarette lighter to ignite a foam ball in the children’s play area on the fourth floor. The fire’s epicenter has been identified as the play area on the fourth floor – near the theater where many children were trapped. The head of Russia’s Emergency Situations Ministry, Vladimir Puchkov, described thick clouds of smoke and limited visibility as temperatures within the mall reached nearly 1,300 degrees Fahrenheit. The fire raged for hours before firefighters could reach the fourth floor. In addition to theaters and a children’s area, that floor featured a large petting zoo. All of the animals are reported to have died. Late Monday, attention began to shift toward Russia’s abysmal fire safety record, with legislators and other officials promising swift amendments to fire safety codes and stricter code enforcement, as they typically have in the wake of past disasters.